The scariest thing for any professional is of course to give in to the urge to be an entrepreneur and strike out on their own. It is just as rewarding, as one can apply ones’ own convictions and chart their own course. Stepping out of the comfort zone and create something new is an exhilarating experience for all. In fact, it is more interesting and exciting for a woman. While it takes a great struggle to break the shackles to aim high, take the plunge and realize their dreams, still they are able to make it to the top. Once a pharmacist, Rina Caiser has achieved all,through her assertive, persuasive and the willing to take risk nature. A woman of substance, Rina was always fascinated by the power of branding and the potential of right communication that has the ability to win hearts and the minds of millions. The challenge of creating a long-standing emotional connect with brands struck her so hard that even in the present day world where everyone is bombarded with multi-platform messaging and attention span almost every micro-second, it was the search for the elusive connect that continued to drive her actions even more. That’s where to give wings to her dreams she co-founded Aakanksha Healthcare along with Vineet Bhagchandani – a platform bestowed to bring a wealth of creativity in healthcare communications. Born and brought up in the city of dreams, Mumbai, Rina is a management graduate from the prestigious school of management studies, NMIMS. Her wish to establish a company can be directly interlinked with her organization’s name. As we have always known that the earliest learning begins at home, the same was in the case of Rina. Rina on her frequent visits to her father’s pharmacy in childhood days was quick to understand that the whole essence of a business lies in putting the customers first. This not only developed trust and esteem but eventually helped her to be a real contributor rather focusing on personal gains. Moreover, watching her mother actively leading their franchise store soon became her key motivation. At Aakanksha, she involves her passion, talent and desires to consistently impress, break through the clutter and deliver works of creativity. Nonetheless, her life partner and fellow seniors at IPCA Laboratories, Indoco Remedies were instrumental in pushing her towards the insatiable aspiration and achieve much beyond. “Our sole desire was to disrupt the status quo in healthcare communication and lift it to the stratosphere. Combining my expertise in Strategic & Marketing Communication for India Business, South East Asia & CIS markets along with the rich experience of my Co-founder Vineet Bhagchandani, who held several senior leadership positions at world-renowned advertising agencies, was just right to foray in consulting,” says Rina. The journey of Aakanksha Healthcare started off way back in 2006 from a tiny workspace but with robust confidence and giant ambitions. Today, Aakanksha Healthcare is the only Indian Healthcare Communications company with the capacity to produce a wide spectrum of award-winning communications ranging from work in Print, Radio, Films Events and Interactive media. “Of course, challenges were there but the clients’ confidence and belief gave us the strength to fuel our passion and escalate as an agency with a holistic and integrated approach.” Team Aakanksha takes pride in its skills and abilities to deliver concise and precise communication while adding its own twist of creativity. It is this accomplishment that has driven them to mark their presence back home and at the global front. 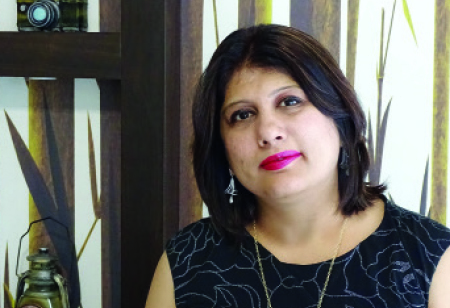 Setting the bar high has been the norm for Rina at Aakanksha Healthcare. Rina carries the legacy of being a distinguished personality among her family and employees and believes in ‘Walk in their Shoes’ approach which naturally flows into other aspects of life. Rina in her excellent career span of 20 years has earned a name for her and has donned many hats of success for Aakanksha – emancipating healthcare with epic creations. With partnering to 50+ clients across 20 nations, the company’s thirst has aided them to deliver enormous solutions in the area of Design, Animation, Film, Digital and Event Solutions and Activation Capabilities along with Social Media Planning for its clients in India, South East Asia, North America, Europe, and Africa. Aakanksha envisages making a greater impact in healthcare communications along with fulfilling its goal of building networks across the globe through its verticals such as Aakanksha Films, Pencil Box Creations, Square & Spirit & Gauze.